As workplaces respond to ongoing internal and external change, continuing education and training has become an imperative, as Chap. 11 and other chapters in this book have made clear. Within this dynamic framework, the roles of managers are also changing, partly through what has been called ‘job enlargement’. That is, more responsibility for an increasing range of activities that were once handled elsewhere in the organisation, usually by specialists. These expanded responsibilities may include occupational health and safety, budget control, and human resource management, but there is also emerging evidence of an increasing role for managers in the training function, both direct and indirect. 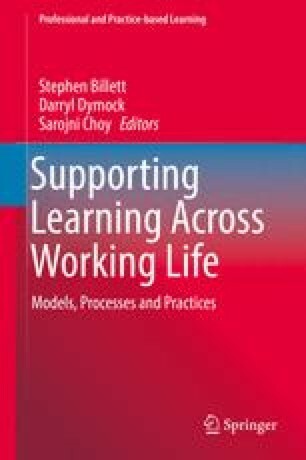 In the research reported in this chapter, 60 managers in five industries and across four Australian States were interviewed about the changes influencing their workplace policies and practices, and of the role of learning and training in helping workers keep current and employable. The findings show that ongoing worker development is an overt, but often under-acknowledged part of these managers’ everyday responsibilities within their workplaces. Specifically, these managers’ roles in training were found to be essential for effective continuing education and training, including fostering workers’ positive attitudes towards lifelong learning for work-related purposes. This chapter discusses the range of training roles required of these managers, as identified in the research, and concludes with a discussion of how managers’ capacities as trainers might be supported and further developed.